A lot of you have been asking me about BB Creams and if I've tried any before. For those of you who have no idea what I am talking about, BB Cream or "blemish balm" is a type of makeup that has swept Asia the last couple of years. It is similar to liquid foundation but is touted to have medicinal benefits and apparently was developed to help heal and conceal patients' skin after laser treatments and surgery. I'm not sure how much of that has trickled down into mainstream bb creams, but it was enough hype to warrant at least trying it, right? I bought mine from an ebay auction and got the type DermaRX from Skin79. I've heard that this one is good for acne-prone skin and is a bit darker than others, as well as having fairly good oil control. One bad things about bb creams is that they usually only come in 1 or 2 shades and as you will see, this is a bit grey on me. I wanted to show the BB Cream size for comparison. This is a China Glaze nailpolish next to it. Pretty small tube, plus it is flatter on the sides. 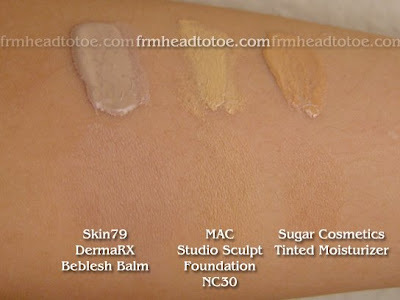 Swatches: DermaRX is a bit grey, Studio Sculpt is closest but a bit too yellow, and Sugar is much too dark and orange. This is natural light. 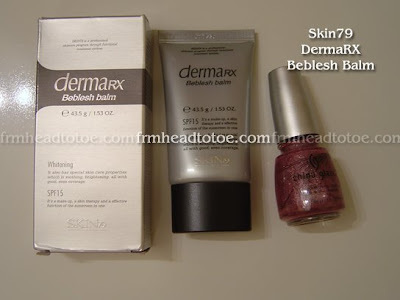 Skin79 DermaRX on my face. Again, it's a bit light and grey on me. Not that bad though, and it does seep in more and match better after a few minutes. I thought the coverage was nice, light to medium applied with a foundation brush but you can layer on areas you need more coverage. I didn't find the oil control to be awesome, but I seem to get oily with any liquid foundations so it wasn't a surprise. Added benefits are that it has spf 20, tea tree oil for acne, and arbutin for whitening. Overall though, I find that I do prefer mineral foundation for everyday use as this still feels like liquid foundation to me. Off and on lately, I've been mixing my facial moisturizer with a bit of DermaRX and the sugar tinted moisturizer to get my own color match and it's been working out quite well. After topping with Everyday Minerals Finishing Dust, coverage lasts longer than mineral makeup. Too bad I'm just not a liquid makeup fan. Don't get me wrong, it's not bad. I'm just too busy to apply it and mix-and-match everyday! I bought 2 tubes so I'll probably list the unopened one in my blog shop soon. i love my l'egere multi white bb cream. but i hate how they are so tinyyyy haha i wish the tubes were bigger! i just got my first bb cream : Skin79 the Oriental Gold... hope it works on me.. I used Lieole's (I think that's what it's called) at first cuz the packaging was pretty but the color was too light. I've tried my sister's but the color still wasn't right for my skin so I gave up. Besides, none of them had good oil control. So the creams didn't fully blend to your skin tone? Interesting. I don't use bb cream everytime I use makeup, but the days my skin feels dull, I always use my Dr Jart black label, great for combination skin, love it! I've also tried skinfoods mushroom bb cream, but it was too oily for me and I didn't like the colour tone on me (I'm a NC15).. 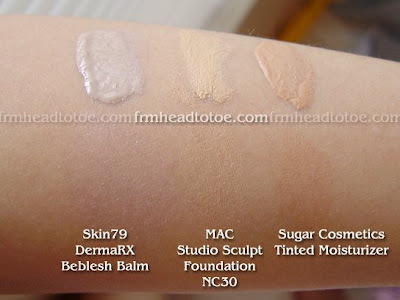 I want to use BB cream because I like the all in one aspect of them (treatment, makeup, moisture, sun protection) but I noticed they seem to be very pink/grey. Surprising since it's from asia. 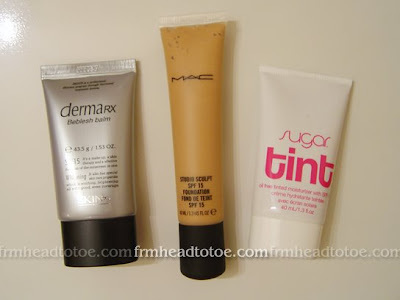 i absolutely love my bb cream but i've never heard anyone mention it before! it was the only somewhat affordable bb cream at my local morning glory. lol. it's called "perfect finish bb cream" from the ICS collection by hanbul i believe. the tube looks fairly small (1.69 fl oz) but it just keeps giving & giving. i felt like when i put it all over my face i looked kinda white in pictures but no one else seemed to think so. it did make my skintone look perfectly even though. i think there's only 1 shade but now i think it matches my skintone really well after it sets. i don't use it all over my face though. i use it more like a concealer. it doesn't give the best coverage in the world but it's fairly decent and it doesn't even feel like i have anything on. if you can find it i highly recommend it. i don't think it has any healing or whitening properties but it hasn't made me breakout or anything. i think it feels much lighter than the mineral makeup i've tried (bare minerals & everyday minerals). I've heard a ton about BB creams especially on Soompi...>< And with the craze and all- I decided to splurge and buy myself a BB cream. I bought it from this place in Pacific Mall- and boy did it make me look really greyish... When I tested it out in the store, it looked close enought o my shadde..but when I tried it out at home- ugh. It looked like I was dead..>< and like you- I have oily skin except mines at this stage wheres its like..
Oily-combo + hormones = wack LOL. i have skinfood mushroom bb~ though the aloe is quite popular too and is slightly cheaper. though it does lighten my face a little, but i don't see the "grey" effect. I've tried missha, skin79 diamond collection and skinfood gingko bb cream. I love the skin79, it's too light for me but I top it off with some mineral foundation mixed with silica powder and I love the result. I have oily skin, so anything that's too light would get oxidized to match my skin tone. I use SHILLS cherry blossom bb cream, which I LOOOOOVE. my HG. it isn't grey, but it is light. I use "Gowoonsesang" BB cream, and I must say I really like it alot, I don't like to put on heavy make up and always didn't like the feeling like my skin can't breathe. But this bb cream goes on really light and has a good coverage. laniege total base bb cream! i love my l'egere multi white bb cream. but i hate how they are so tiny haha i wish the tubes were bigger!